This cute little bust is a tailored mannequin bust child from 6/8 years. 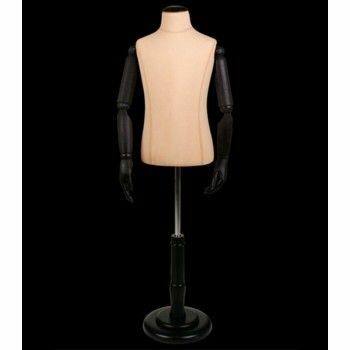 This window mannequin does not have a head but has black wooden arms. It is supplied with a round base in black wood that fits perfectly with the arms. The body of the bust is beige, with black accessories, it brings a touch of elegance to the mannequin. This bust is available in child delivery within two weeks. Tailored mannequin bust child 6/8 years. Mannequin headless but with black wooden arms. Supplied with a round base in black wood that fits perfectly with the arms. Availability delivery within two weeks.